The man to the left is a man I would have liked to known. Unfortunately, we were born 202 years apart. 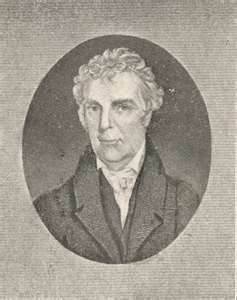 Barton W. Stone was a frontier preacher who sounded the call for unity during the 2nd Great Awakening. He was also one of the most influential leaders of the American Restoration Movement (otherwise known as the Stone-Campbell Movement). The religious unity movement that birthed the Churches of Christ, Christian Church and Disciples of Christ. Imprimis. We will, that this body die, be dissolved, and sink into union with the Body of Christ at large; for there is but one body, and one Spirit, even as we are called in one hope of our calling. Item. We will that our name of distinction, with its Reverend title, be forgotten, that there be but one Lord over God’s heritage, and his name one. Item. We will, that our power of making laws for the government of the church, and executing them by delegated authority, forever cease; that the people may have free course to the Bible, and adopt the law of the Spirit of life in Christ Jesus. Item. We will, that the people henceforth take the Bible as the only sure guide to heaven; and as many as are offended with other books, which stand in competition with it, may cast them into the fire if they choose; for it is better to enter into life having one book, than having many to be cast into hell. Item. We will, that preachers and people cultivate a spirit of mutual forbearance; pray more and dispute less; and while they behold the signs of the times, look up, and confidently expect that redemption draweth nigh.